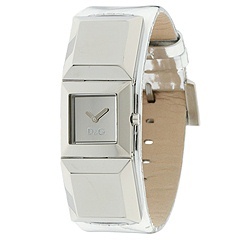 Stay refined and on time with this modern DG watch. Stainless steel case. Genuine leather strap with buckle closure. Two hand analog quartz movement. Water resistant to 5 ATM. Comes in a silver leather gift pouch. Dimensions: Face 16mm W x 14mm H Face Depth 8mm Band Width 23mm Band Circumference 7 inches Two year limited manufacturer's warranty. Japan movement. 2.00 oz. Free shipping in the USA.